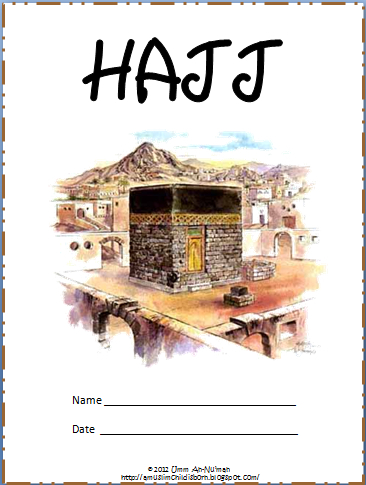 This theme pack is a small supplementary pack that can be used when teaching preschool and kindergarten children about Hajj. If you have questions about how to use any of the activities please leave a comment insha'Allaah. Word/Picture Matching activities (for the cards: cut them out, mix them up and invite children to match the picture cards with the word card that describes each picture). Graphing Work (use a paper clip and push pin on the spinner. Allow each child to spin the spinner 4 times and note/mark down how many times they land on each picture). Hajj Sequencing cards (for self-checking you may wish to write numbers on the back of each card that tells which card is first, second, third, etc. in the sequence so that after completing the activity the child can self-correct if needed). A Hajj puzzle and more! All clipart/images/illustrations are copyrighted and appear courtesy of Sister Umm Hanifah and Brother Abdul Hameed. Files on A Muslim Child is Born may be used in classrooms and homes but may not be sold, altered in any fashion, nor are elements to be extracted from the files. Jazakillah for this wonderful, all in one hajj printable. Wa iyaki ukhti. Insha'Allaah your family benefits from it and enjoys it. I was wondering what to do for Hajj with Maimoonah and this has come so handy at this moment of time. As usual simply wonderful. Jazzakillaah Khayr for all your continuous efforts. May this be a sadaqah jaariyah for you. Aameen! Alhamdulillaah! Insha'Allaah Maimoonah enjoys it and benefits from the pack. Wa iayki and ameen thumma ameen to your dua! Ma sha'a Allah sister! Really complet and beautiful. Barakallahu fiki for share! Alhamdulillaah. Wa feki. Insha'Allaah it is beneficial for the children. I used the body theme pack and an naas and al ikhlass with my youngest during our most recent trip and he loves them esp the games mashaaAllah. Jazakillah khair! Yes, insha'Allaah I will try to include printing instructions in the future....barak Allaah feki. Alhamdulilaah that your youngest enjoyed the games and activities. All of the praise is due to Allaah. I forgot to mention that the link that says, "How do I use it?" is a bit down and on the left hand side of the page. Jazakillah khair! Got it now! Jazaakillah Khayrun for taking the time to make this and benefit others with this. Hayyakillaah. Wa iyaki dear sis Ummabdarrahman for taking time to leave a commment. Insha'Allaah, your family benefits and enjoys the pack. Wa iyaki. Jazakillaahu khayr for your kind words and dua'. Indeed all of the praise and thanks are due only to Allaah. I can't seem to download the pack - here's the error: The user hosting this content is out of bandwidth. Perhaps you can use a free dropbox account as a backup download link. Jazakillaahu khayr dear sis for bringing this to my attention. Please try the link again - it should work. Assalam alaikum and jazakillahu khayran once again for your hard work. I have printed and prepared the activities I think my children (age 3) are ready for and look forward to doing them together. I wanted to download some of your older hajj activities as well but the error message "out of bandwith" keeps coming up. Can you please kindly look into this for us? Wa iyaki. Jazakillaahu khayr for your comment. These links will also be included in this post for convenience insha'Allaah. Jazakillahu Khayran! May Allah reward you with the best! Assalamu alaikum wa rahmatullahi wa barakatuhu wa mag'firatuh. Sorry dear sister, how to use pages 25-26? please help with this, jazakiAllah khair! Assalamu alaikum wa rahmatullahi wa barakatuh wa mag'firatuh. Soo sorry again sister, now i find out about graphing))). thank you very much for helping for mums to grow their kids in right way of islam). Jazaki Allah khair fid dunya wal akhira! Alhamdulillaah that you were able to find the information needed. If you have any other questions, please feel free to ask insha'Allaah. Please see the new links for the Hajj Counting Story Board in this post (the Hajj theme pack post). I tried to download the other files in your older posts but it has that bandwith error. Is there some other place I can download them from? Wa iyaki. Can you please indicate which files you are trying to download (i.e. the names of the files)? An alternate link can be provided insha'Allaah. Jazakillaahu khayr dear sis Nadia. The salat one, though i can't seem to find the post :( , Arabic colors go fish, and the 5 senses for now. I want to print the other suwaar too (i got An Naas and Al Ikhlaas) but later on inshaAllah. My son especially loves game-based activities and seems to not like worksheets as much so I had to kind of do more game-based activities and sneak in worksheets in between. Barak Allaahu feki. If you check both posts (i.e. 5 Senses and Arabic Colours Go-Fish) there are alternate links (the links are red) to download the files. I have only recently started doing schooling with my child and am very grateful for the lovely resources that you have kindly shared here. Unfortunately, I am having trouble dowloading the Hajj theme pack for Kindergarten. I am able to see the preview but nothing happens when I click Download. Are you able to help? Thank you so much! If, after doing so, you are still unable to download the pack, please do let me know and we will continue to try to find a solution in shaa' Allaah. I am unable to download these files meniotned below, can you please help. Hajj Counting Story Board without boxes or numbers on the hujjaj "
Jazakillaahu khayra dear sis Annie for your message. Please check back later today or tomorrow and insha'Allaah the issue should be resolved. Jazakillaahu khayran for bringing this to my attention. Sis Annie, the links have been fixed alhamdulillaah. Please leave a comment if you still have difficulty downloading the files. Jazakillaaahu khayra.